The primary purpose in the study of any martial art is the development and cultivation of the spirit of humility. In conjunction, you, as a student, evolve the technical ability and adequate strength to render an aggressor in a safe and controlled manner. If you wish to become a true exponent of any martial art, you must tread the paths in spiritual and physical perfection. In order to fully understand the innermost secrets and fundamental nature of any martial art, the student must train with the proper attitude, exhibit courtesy and the correct etiquette. It has to be noted that the enhancement of both elements should be developed in a parallel progression. If the physical skills have advanced without learning the spiritual knowledge, the equilibrium within any martial arts regresses into brutality and violence. A true martial art is a way of life, developing with you as you learn. There is no hindrance to prevent you from incorporating martial arts in your life; you have the opportunity to integrate a martial art into your current lifestyle. 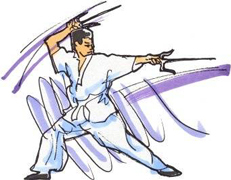 Kodokan Martial Arts encourages beginners to start training in martial arts of Karate and/or Kobudo. You can be a novice or trained for many years, old or young, there are no restrictions; any form of martial arts is an investment in you. You have decided to improve yourself by endeavouring to learn and practise martial arts. 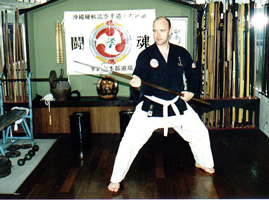 Constant training improves the student's ability to learn the technique and muscle memory for the technique to become natural in its execution, without thinking. 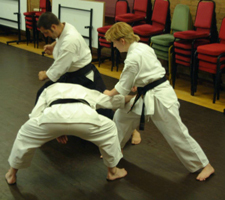 By training regularly the student should progress through the belt system, providing the training is progressive. That is only "Perfect Practice promotes Perfection".